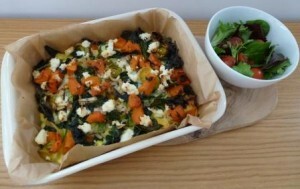 This recipe is for a vegetarian no pastry quiche with ricotta and sweet roasted pumpkin. It’s colourful, tasty and a great way for the family to get 2 of their 5 a day. It’s packed full of healthy goodness and is versatile for families as it can be eaten at anytime of the day, hot or cold. I use organic vegetables as these taste better and are grown without chemicals. As an alternative to sprouting broccoli, this quiche can be made with baby spinach. Preheat oven to 200°C (180°C for fan ovens). Line a large baking tray with non-stick baking paper. Place the pumpkin on the lined tray and spray with olive oil. Bake in oven for 25 minutes or until golden. Chop the sprouting broccoli into 2 cm pieces. Place in a pan with water and boil for 2 minutes. Drain. Heat a large non-stick frying pan with a little olive oil over medium heat. Add the leek and cook for 5 minutes or until soft, stirring occasionally. Add the garlic and cook for 1 minute or until soft. Add the sprouting broccoli and stir for 1 minute (or if adding baby spinach, stir for 3 minutes or until the spinach wilts). Line a 26cm x 16cm (base measurement) baking dish with non-stick baking paper. Spread the pumpkin and leek mixture evenly over the base of the pan. Whisk the eggs, egg whites and milk in a jug. Pour the egg mixture evenly over the pumpkin and leek. Sprinkle the ricotta evenly over the vegetables. Bake for 25 minutes or until puffed and golden. Sprinkle with basil. Enjoy the quiche on its own or serve with mixed salad leaves. This is such an easy recipe for a really nutritious meal. I make this soup using all organic vegetables, they’re free from chemicals so better for your family and the soup will taste delicious. 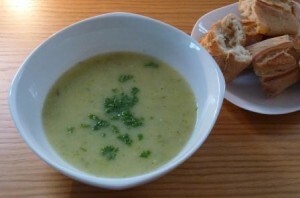 This Leek and Potato Soup recipe can be prepared in 10 minutes and within 30 minutes you’ll be sitting down and enjoying ladles of hearty, warm and filling soup. Serve with some crusty bread on the side for lunch and the family will be full until dinner time. Melt the butter in a large saucepan on medium heat and sauté the garlic and onions for a few minutes, stirring frequently. Add the remaining ingredients and bring to the boil. Simmer for 30 minutes. Purée soup with a hand blender. Serve with fresh crusty bread. Riverford have just launched their brand new Riverford iPhone App with over 770 searchable recipes, inspired by their Field Kitchen restaurant and the recipes included with Riverford vegboxes. The Riverford iPhone App is free and easy to use! Just scroll through and select the veg you want to use, using the Riverford veg machine. Click ‘results’ and you’ll be taken through to a list of recipes that match the vegetables you have. Alternatively, you can search or scroll through over 700 recipes. Search by ingredient, cuisine, season or eating occasion. You can download the Riverford iPhone App here. Today only! 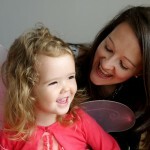 20% off selected t-shirts and tops at Vertbaudet for babies, boys and girls. Enjoy outdoor play all year round with with great offers on trampolines, swings, sandpits and outdoor toys at Kiddicare. © 2019 Only Best For Baby. All rights reserved. Premium WordPress Themes.